Photo submitted by Gary Stanford Stephen and Megan Ward, Matthew and Melissa Stanford, Diane and Gary Stanford, Adam Stanford and Lisa Mulgrew, and Amberley and Sean Stanford were in Calgary during the Stampede to accept the BMO Farm Family Award for Cardston County. 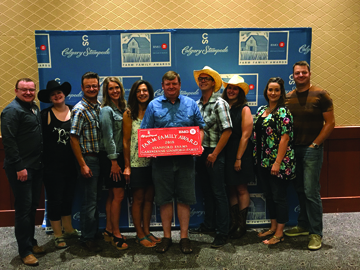 The owners of Stanford Farms in Cardston County received the 22nd annual BMO Farm Family Awards, along with 19 other southern Alberta families, at the Calgary Stampede last week. Gary Stanford, who attended the ceremony with his wife Diane, their four kids and their significant others, says he was informed by county fieldman Rod Foggin that he won the award. The family traveled up to Calgary on July 8 to accept the award the next day at the BMO Centre on the Stampede grounds. Gary emphasized that the award belongs to the Stanford family, not him alone. “Our family is quite involved in the community,” he said. The Stanford family farms grain and oilseed, which includes wheat, barley, canola, flax and other crops. “It’s nice when people recognize when you’re trying to help the community and help do work in the area,” said Gary, who was president of the Grain Growers of Canada for three years, as well as the current vice chair for the Alberta Wheat Commission. He’s been a southern Alberta farmer his entire life, having been born and raised on a farm near Cardston. Agriculture Minister Oneil Carlier was present at the ceremony, whom Gary has encountered many times before in his staunch advocacy for improving agricultural education in Alberta’s curriculum. Gary works with the Agriculture Innovation Centre in Magrath to promote enhanced agricultural learning. He stressed the importance of agriculture for everyone, but especially in Alberta, where it is the second-largest employer behind the oil and gas industry. “I’m trying to help work with the provincial government to make this a little more important for the education ministry,” Gary said, adding that teachers from as far as Mayerthorpe, Calgary and Fort Macleod have enlisted his support.